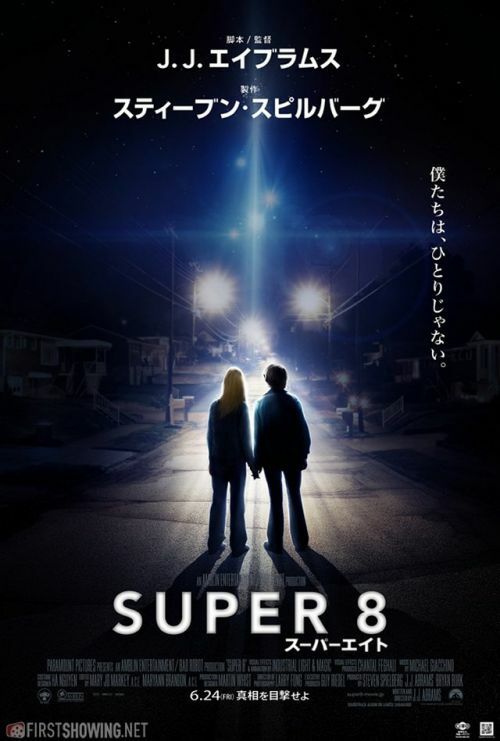 Despite what some of you are saying in the comments, this poster is not fake, this is an exclusive japanse poster for Super 8. The official Super 8 facebook has reposted the link to the poster over at firstshowing.net so that pretty much confirms it. I don't know if most of you are familiar with international posters, especially the japanese style, but there's nothing on here this poster that would lead me to believe it's fake, it may not be the greatest looking poster, but it's not fake. It doesn’t look fake. I like it and someone said it says ” WE ARE NOT ALONE “. Indeed, that’s what it says on the right side (going down.) If you don’t believe me, type in WE ARE NOT ALONE in Google Translate. Thanks for the poster update. About 11 cities so far. You’ll need an RSVP code from the local tv and radio stations, newspapers, websites, and blogs. Good luck to all who live in these cities! The 3 brightest lights kind of resemble the 3 dots we see on everything related to the military in the movie. I can’t confirm if the poster is legit, but I can confirm that is the street that several scenes were filmed on. appears it is a mirror image, the left side of the street is original and right side is mirrored. I live on this street. Picture of houses was taken after filming, as the vinyl hand railings and larger plastic mail boxes were removed from our houses and replaced after filming. No I don’t live on a mirrored street, but your post did have me go back out and look closer. The white hand rails and mail boxes, on both side of the street in the poster, are actually the same mail boxes. The couple homes on the right in the poster, are actually the neighbor’s homes to the left of the last house by Elle’s character. I see what your saying. That would make more sense. Question: are those bright orange lights, under the blue ones, street lights? They are street lights, the star shape comes from the way the photo was taken, it was done at an aperture that creates those shapes based on the f/number. They are definitely street lights. And on the right of the pic, near Joel’s shoulder, those lights are a lamp post and two lights at the end of a driveway. Why would anyone think this poster is fake at all? Firstshowing is a popular website. Did you guys read the article? It clearly says “Paramount has asked us to unveil.” There is no way this website would say something like that and then publish a fake poster. I’m surprised anyone would even think that… but I do think it’s a very cool poster, I like it a lot. If you look really closely at ties on these two gentlemen you will see I have added them to the photo. The poster is official but the picture is fake. It was released by paramount but if you don’t understand what 1mountaineerfan is saying I will try to explain. Both sides of the street are the same side of the street. It’s one side broke in half and used to look like a left and right side of a street. If you were to turn the right side of the street in a 180 and place it on top the left side (guardrail to guardrail) you would see that it is just 1 side of a street. This means the two yardlamps you see to the right of Joe are actually exactly to the left of Elle just out of poster view. Anyways I am glad the spaceship/s have been confirmed. All movie posters are photoshopped 🙂 There was just a lot of talk about the actual poster not being official, which is what I was referring to in regards to “fake”. But I get what you’re saying on how it was put together. “Ore-tachi wa, hitori ja nai” (literally: “we’re not alone”). Awsome ‘Close incounters’ kind of poster . looks way better than the water tower one.